Remember the day when feather jewelry was all the rage? I do, but then I am getting old and I can remember lots of great trends from the 50s, 60s, and 70s better than most people my age. In fact, those from the “Woodstock Era”, if they were wearing clothes (and some who weren’t wearing much) were adorned with all kinds of feathers and beads, leather wrist bands and belts, and beaded mocassins or leather and wooden clogs. Many of the low-riding hip hugger, wide-legged bell-bottom jeans showed off handmade belts of leather and suede cording with lots of beads and feathers dangling from the fringed ends that hung down past the knees. As a continuation of our “Blast from the Past” from yesterday, tonight’s blog keeps on going with some more memorable moments in fashion. Paisley fabrics, maxi dresses, and hippie garb were the perfect backdrops for lots of different feather accessories. Whether it was a bracelet, necklace, or hair accessories, feathers came in all colors and sizes and often were the main focus instead of the clothing. Great part about fashion trends . . . these always return, sometimes with subtle changes but most of the time, you will see some of the same styles, colors, and accessories return. Such is the case with feathers. Last year, we saw feathers in the hair on many celebs. And, mothers and daughters were wearing matching colors or matching their feather hair extensions with their outfits. While the rage for feather hair extensions has subsided a bit, it is still trendy to adorn your hair and other areas on your body with feathers and beads. Here are just a few suggestions from the Divas. How many more can you think of? The Divas have fashioned a variety of colorful feather earrings and are now in the process of creating unique headbands, hair accessories, and unusual pendants with plumage from some of our fine feathered friends’. Be sure to check out the Vintage Collection under our Portfolios to see some of the selections we have ready for sale. When you find the perfect addition to your fashion accessories, follow the link to our ETSY Store to make your purchases or CONVO with the Divas to place a custom order. 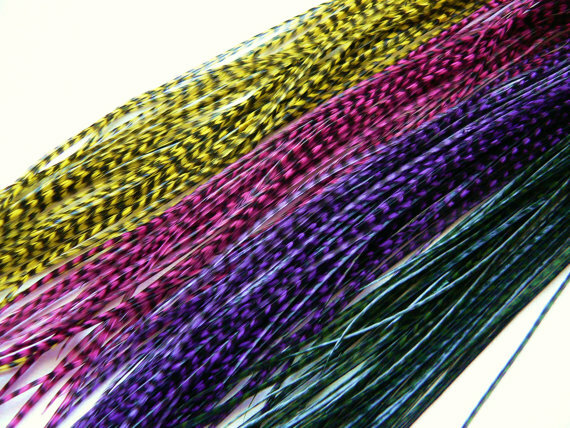 We also have great specials on feathers for hair extensions featuring grizzly rooster tail and guinea hen feathers in natural colors. All are stylable, curlable, and can be washed just like your real hair. We invite all of our followers to send us photos of yourself with your favorite feather accessory or wearing a trendy outfit from the past. Come on now . . . don’t be shy . . . it’s time to strut your stuff and show off those gorgeous feathers and trendy fashion statements! 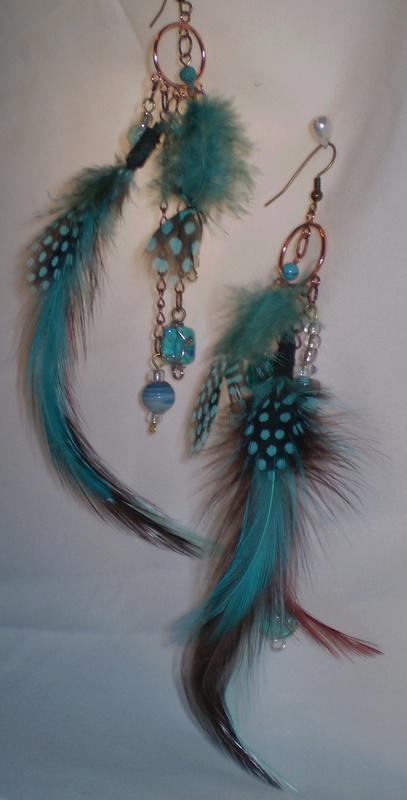 If you have some special feathers that you would like the Divas to use in designing a unique custom piece of jewelry for you, please contact us either by using our contact form on our Contacts page or CONVO us through our ETSY Store. We love a challenge and get excited when our shoppers want us to create something special just for them. 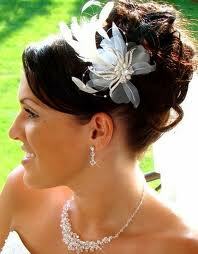 White feathers are great enhancements for bridal jewelry, bouquets, and headbands. Well, darlings . . . we hope we have inspired all of our followers to try something different and add some vintage “blast from the past” to your accessories this summer! As always, your comments are always encouraged; and don’t forget . 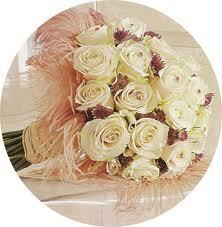 . . we love to receive suggestions for other ideas or topics of interest. ‘Till next time . . .
We recently discovered some great vintage Bohemian styled scarves that we just had to splurge on. We finally received our last order and have included them under our Vintage Category at our ETSY Shop. So, for those of you who may have read our ‘Tweet or saw the Shared Link on our Facebook page, we thought we would include some great ideas for using these vintage pieces of memorabilia from the ’70s. Ahhh… I do remember those days … the flower children, all the hippies and the peasant shirts. 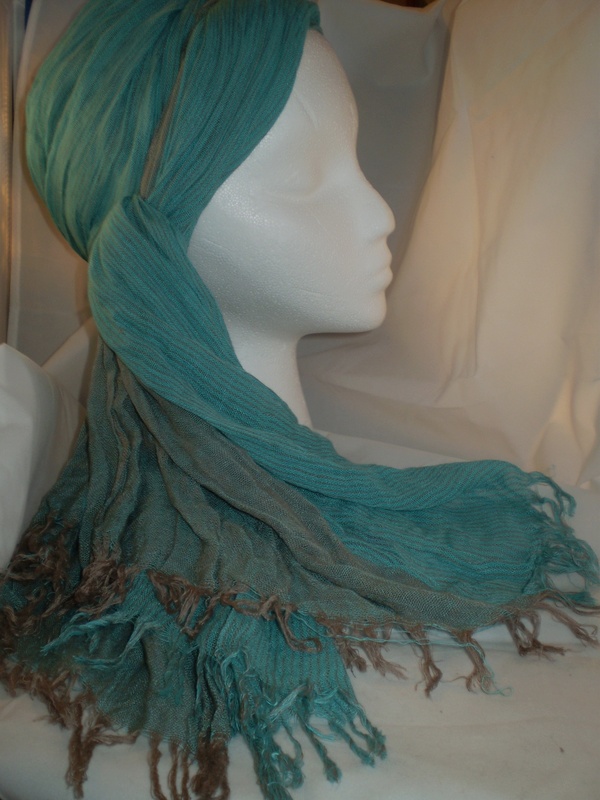 These wonderful 24 inch wide, 60 inch long gauze and linen scarves can be used as an accessory to accent any wardrobe. To help you with how to use these great additions to your summer and fall fashions, the Divas have provided a FREE bonus with photos and instructions on How to Use a scarf with 37 tips in a PDF document for you to download. Click the image above (37 ways to tie a scarf) to download your FREE Bonus! Check out the scarves in our ETSY shop by clicking HERE. Comments are welcome and feel free to share some of your own ideas and thoughts about how you use scarves. Tell us your color preferences, what types of scarves you use, and where you usually go to find a great scarf to accessorize your wardrobe. Hope you enjoyed this little blast from the past . 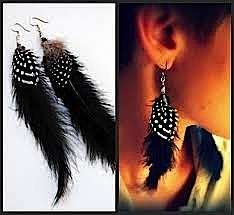 . . tomorrow, we will feature our BOHO feather accessories and earrings!